In my previous post I wrote about 20+ notepad tips & tricks. Today again I've got one most interesting notepad trick to offer you all. 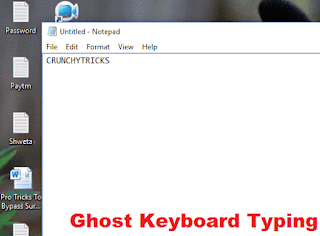 It is termed as "Ghost Keyboard Typing". The idea behind this trick is quiet simple; notepad starts typing automatically whatever we want. Interesting? of course a big Yes! You can use this to prank your friends or to amaze them with your technical skills. Now you might be thinking it as one of the toughest task made for only tech geeks. Then wait let me tell you the truth, you're completely wrong friend. No technical skills are required to use this wonderful trick. You can easily implement it even if you're familiar with only Notepad. It's enough for this tutorial. Just follow the guide written in simplified steps. Key Point: - You don't even need to touch your keyboard and words are written in notepad on their own. Navigate to your desktop, right click on it and create a new text document (Or simply open notepad and create a new file). Copy and paste the following piece of code into it. Then go to File>>Save and select Save as type to all from drop down list. Name it as anything.vbs (Remember file extension should be .vbs only). Run it and see the magic. So this was all about ghost keyboard typing. I hope you would like slow typing in notepad. For any doubt or query feel free to leave a comment for us.